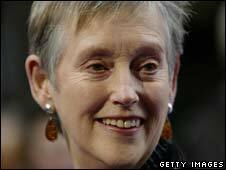 In an interview in a Spanish newspaper, published in the Daily Telegraph, Dame Stella Rimington, 73, also accuses the US of "tortures". It said any policies which impact on privacy must be "proportionate". Dame Stella, who stood down as the director general of the security service in 1996, has previously been critical of the government's policies, including its attempts to extend pre-charge detention for terror suspects to 42 days and the controversial plan to introduce ID cards. "It would be better that the government recognised that there are risks, rather than frightening people in order to be able to pass laws which restrict civil liberties, precisely one of the objects of terrorism - that we live in fear and under a police state," she told the Spanish newspaper La Vanguardia. Seven years after 9/11 it is time to take stock and to repeal abusive laws and policies enacted in recent years. She said the British security services were "no angels," but they did not kill people. "The US has gone too far with Guantanamo and the tortures," she said. "MI5 does not do that. Furthermore it has achieved the opposite effect - there are more and more suicide terrorists finding a greater justification." Dame Stella's comments come as a study is published by the International Commission of Jurists (ICJ) that accuses the US and the UK of undermining the framework of international law. Former Irish president Mary Robinson, the president of the ICJ said: "Seven years after 9/11 it is time to take stock and to repeal abusive laws and policies enacted in recent years. "Human rights and international humanitarian law provide a strong and flexible framework to address terrorist threats." The BBC's security correspondent Frank Gardner said the ICJ report would probably have more of an impact than Dame Stella's remarks because it was a wide-ranging, three-year study carried out by an eminent group of practising legal experts. Dame Stella appeared to be more restrained in her comments than the ICJ, he added. She was keen to stress the risk of civil liberties being curtailed, while the jurists insisted that international law had already been "actively undermined". Shadow security minister Baroness Neville-Jones said the Conservatives were "committed to ensuring that security measures are proportionate and adhere to the rule of law". The Tories said the government's push to extend the detention time limit for terror suspects was the kind of measure condemned by the report. Isabella Sankey, director of policy at Liberty, said she was "enormously heartened" by what Dame Stella had said. "Over the last seven years, we've seen a number of measures passed, some of which affect very few of us in a horrible and terrible way, whether that's house arrest under control orders or rendition and torture in foreign states," she said. "We've also seen many, many measures that affect all of us just a little bit and, most of all, which seriously impact our rights to privacy. "We have very broad police powers which sweep the innocent up with the guilty." A Home Office spokesman said: "The government has been clear that where surveillance or data collection will impact on privacy they should only be used where it is necessary and proportionate." "This provides law enforcement agencies with the tools to protect the public as well as ensuring government has the ability to provide effective public services while ensuring there are effective safeguards and a solid legal framework that protects civil liberties." Liberal Democrat foreign affairs spokesman Ed Davey said: "This is damning testament to just how much liberty has been ineffectually sacrificed in the 'war on terror'." Dame Stella became the first female head of MI5 in 1992.